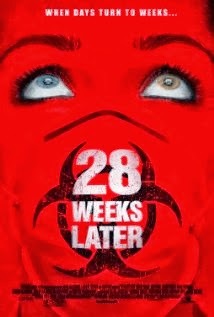 Tonight's movie is the follow up to the one we watched yesterday, 28 Days Later. Since I already did a full zombie review, the only thing left to talk about is the movie itself. The zombies are for the most part, exactly the same as in the first movie and nothing new is really learned about them. Which is too bad really because I wanted more than just some text scrolling on the bottom of the screen about what had happened to the zombies. The movie, after a flashback, picks up after all of the zombies are dead. Then the one group of kids who were allowed to enter, who happen to be the kids of a man who has badge access to every area, who also happens to have a old house in town, where there mom (thought to be dead) just happen to be hiding... You get the idea right? It is just a crazy string of coincidences and it is hard for me to look at is as a "good" movie. It is a real shame too since the first one was so good. I am known for being too picky about movie plots and this is probably one of those times where I am being too critical. I am basing this on the fact that the movie has a 7.0 on IMDB and a 71% on Rotten Tomatoes. In terms of zombie movies, I would give this one a 4/5, but only because it is still a good story as long as you don't think about it too much. I was so close to giving this one a 3/5, but I just can't bring myself to do it since it is a solid second piece of the story. From what I said about the movie yesterday, this one really just falls short. No humor or love story like in the last one. If you have seen the first one then you should probably see this one too. Even if it has a plot that could have used more thought, it is still a well put together movie in terms of sound, special effects, and acting. See my last post here for my actual zombie review on these zombies. That is all I got for now so check back tomorrow for more zombie reviews!